DGT100BC and DGT100AN models: Reading of microvolts or ADC converter for all the channels; Message display; Printing; Setting of APW in counting mode; Simulation of key pressure; MODBUS serial protocol. Version with specific program for using the indicator as a universal weight repeater or as a multi-scale repeater (MASTER) in combination with DFW/DGT/MCW. Weight indicator/ repeater with large matrix display composed of very intense bright LEDs. Particularly suitable for outdoor uses, it is clearly visible even in full sunlight and where it's necessary to view from a distance at any angle. Case completely in IP68 stainless steel. CE-M approved (OIML R-76 / EN 45501). MID approved (OIML R-61). Large 6-digit display, 100 mm high, with very efficient SMD LEDs, complete of 6 Leds for indication of active functions, visible from over 25 m, with viewing angle up to 120° and with power up to 750 mcd. Software adjustment of the brightness intensity by keyboard. 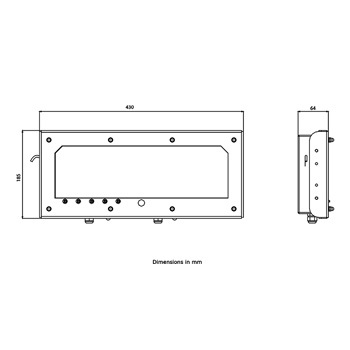 AISI 304 stainless steel case with IP68 protection complete of wall fixing bracket. Fitted with an anti condensation air valve for regulating the humidity and the pressure inside the indicator. PROFIBUS serial interface (DGT100PB model). 16-bit analogue output (DGT100AN model) 4-20mA / 0-5Vdc / 0-10Vdc at choice; maximum applicable voltage: 350 Ohm; minimum applicable voltage resistance: 10 kohm. DGT100BC-1 Weight indicator with 100mm LED display. IP68 stainless steel case, 5-key keypad, and air valve for regulating the humidity and the pressure. DGT100AN-1 Weight indicator with 100mm LED display and analogue output. IP68 stainless steel case, 5-key keypad, and air valve for humidity and pressure regulation. DGT100PB-1 Weight indicator with 100mm LED display and Profibus. IP68 stainless steel case, 5-key keypad, and air valve for regulating the humidity and the pressure. DGT100S 2 stainless steel brackets for fixing on the ceiling or table. DGT100V Attached stainless steel visor. It protects from sun and rain and improves the indicator visibility.